Pichavaram is situated 16 km from Chidambaram. Pichavaram ranks among the most exquisite scenic spot with abundant and varied tourism resources. The backwaters, which are interconnected by the Vellar and Coleroon system, offer abundant scope for water sports rowing, Kayak and Canoeing. 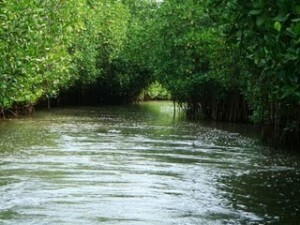 The Pichavaram forest not only offers waterscape and backwater cruises but combines another varies rare occurrence-the mangrove forest trees permanently rooted in a few feet of water. The Pichavaram mangroves are considered among the healthiest mangrove occurrence in the world. Pichavaram consists of a number of Islands interspersing a vast expanse of water and covered with green trees. The area is about 2,800 acres and is separated from the sea by a sand bar, which is a patch of extra ordinary of loveliness. TTDC offers boating facility to the visiting tourist. TTDC’s Aringmar Anna tourist complex houses, cottages, and a restaurant catering to the needs of tourist. Bus, taxi, auto rickshaw are available. This entry was posted in Pichavaram Forest, Tamil Nadu and tagged Forest. Bookmark the permalink.